The ArmorFlex protects your truck bed cargo with heavy-duty folding panels that are coated with a LINE-X® specialty automotive coating that protects the cover from dents and scuffs. Premium-Grade Coating The UnderCover ArmorFlex has a premium-Grade LINE-X® coating that provides superior dent, scuff & ding protection. Matte Black Finish The UnderCover ArmorFlex has a stylish matte black appearance. Heavy-Duty Construction The UnderCover ArmorFlex has a heavy-duty panel construction for ultimate strength and durability. Low-Profile Design The UnderCover ArmorFlex features a low-profile design providing the ultimate security while maintaining a stylish appearance. The new ArmorFlex hard folding cover is designed to protect your truck bed and its contents, while maintaining its strength, style and durability. 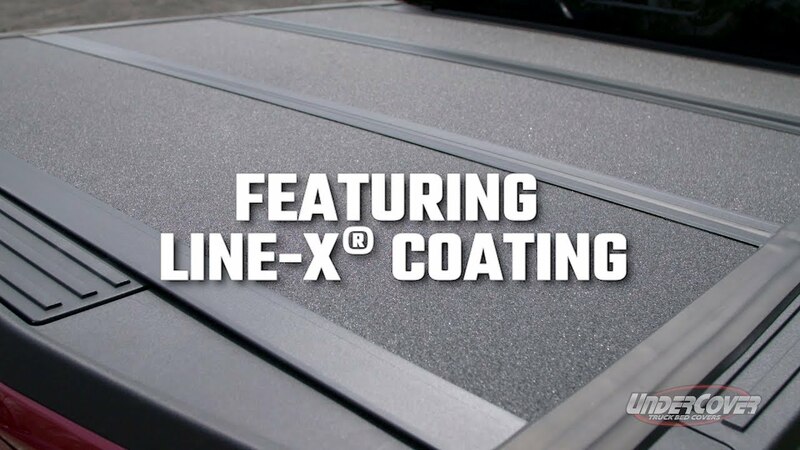 Heavy-duty aluminum panels are coated with a LINE-X® specialty automotive coating designed to provide advanced protection from dents and scuffs, even in the most extreme environments. The dual-action tailgate seal offers universal tailgate operation, allowing you to close the tailgate with the last panel of the cover up or down. ArmorFlex is proudly made in the USA, and comes backed by a 5-year warranty. The UnderCover ArmorFlex tonneau cover can be installed on your pickup in minutes. It has an easy clamp on installation. Each products comes with easy to understand vehicle specific installation instructions. UnderCover, Inc. warrants the structure of your ArmorFlex Cover to be structurally free from defects in material and workmanship for (5) five years from the retail date of purchase. The hinges, seals, and hardware are warranted to be free from defects in material and workmanship for (5) five years from the retail date of purchase. This warranty applies only to the original purchaser and is nontransferable. Your original sales receipt will serve as proof of purchase for this warranty. Before credit can be issued on a warranty claim, proof of defect may be required. This can be determined at the time of the claim. Always read the ingredients of any product you are using to clean your ArmorFlex Cover. Make sure that you use only products that are safe for use with rubber. Many chemicals contain material that will permanently discolor or damage your Flex Cover hinges and seals. This is not considered a manufacturer defect. Incidental or consequential damage or loss of contents due to use, neglect, lack of maintenance, misuse or abuse of the ArmorFlex Cover is the sole responsibility of the truck owner and operator. Paint damage to your truck is not covered under this warranty. When operating your truck always keep the ArmorFlex Cover in either the fully closed and latched position, or one of the two approved open positions. The first approved open position would be the first, second, and third panel stacked onto the forth panel and the buckles must be secured together. The second approved open position would be all four panels standing up vertically behind the cab. In this position both prop rods must be attached and the buckles secured. Do not operate the truck at excessive speeds with the ArmorFlex Cover in either open position. UnderCover recommends periodically checking star knobs tightness and correct washer placement to ensure a tight fit. In the event that your ArmorFlex Cover is found to be defective under the terms of this warranty, it is at the discretion of UnderCover, Inc. to repair or replace the defective part. All repairs must be made under the direction of UnderCover Inc. UnderCover Inc. is not responsible for any transportation costs associated with the warranted claim. The panels of your ArmorFlex Cover require only periodic cleaning with mild car wash soap. Avoid use of all abrasive type cleaners as they may dull the finish. Some chemicals and fluids such as insect repellents, oils, solvents, and lubricants could potentially damage the rubber hinges and seals and void the warranty.